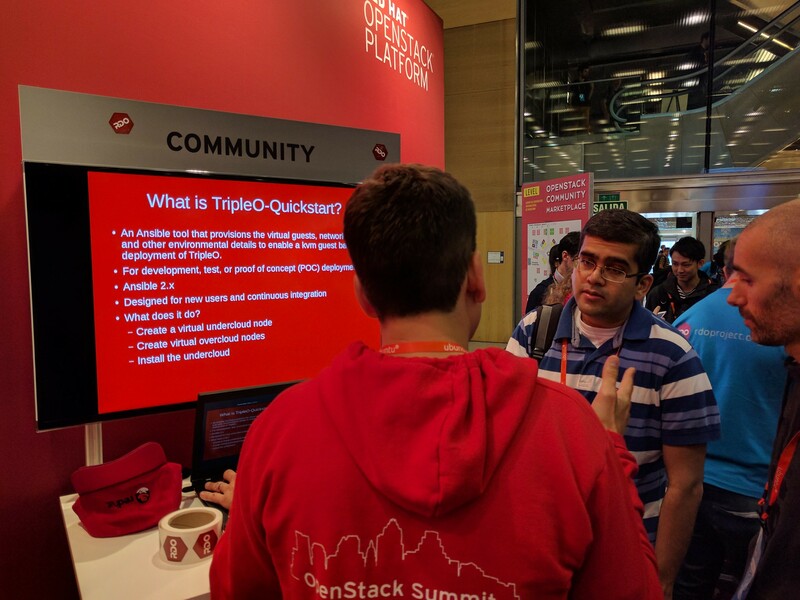 During the first two weeks of May, I attended Red Hat Summit, followed by OpenStack Summit. Since both events were in Boston (although not at the same venue), many aspects of them have run together. On the first day of Red Hat Summit, I received the mini-cluster, which had been built in Brno for the April Brno open house. There were one or two steps missing from the setup instructions, so with a great deal of help from Hugh Brock, it too most of the first day to get the cluster running. We’ll be publishing more details about the mini-cluster on the RDO blog in the next week or two. However, most of the problems were 1) it was physically connected incorrectly (ie, my fault) and 2) there were some routing table changes that were apparently not saved after initial setup. Once the cluster was up, we connected to the ManageIQ cluster on the other side of our booth, and they were able to manage our OpenStack deployment. Thus, we were able to demonstrate the two projects working together. In future events, we’d like to bring more projects into this arrangement – say, use Ceph for storage, or have ManageIQ managing OpenStack and oVirt, for example. After we got the cluster working, in subsequent days, we just had to power it on, follow the startup instructions, and be patient. Again, more details of this will be in the RDO blog post in the coming weeks. I had conversations with two groups about planning upcoming CentOS Dojos. now tentatively scheduled for the first Tuesday in September. (If you saw my internal event report, I mentioned July/August. This has since changed.) They’re interested in doing a gathering that would be about both CentOS and OpenStack, and draw together some of the local developer community. This will be held in conjunction with the local LOPSA group. The second Dojo that we’re planning will be at CERN, where we have a great relationship with the cloud computing group, who run what we believe to be the largest RDO installation in the world. We have a tentative date of October 20th, immediately before Open Source Summit in Prague to make it easier to combine two trips for those traveling internationally. This event, too, would cover CentOS topics as well as OpenStack/RDO topics. The Community Central area at Red Hat Summit was awesome. Sharing center stage with the product booths was a big win for our upstream first message, and we had a ton of great conversations with people who grasped the “X is the upstream for Red Hat X” concept, seemingly, for the first time. The “The Roots Are In The Community” posters resonated with a lot of people, so huge thanks to Tigert for pulling those together at the last minute. The collaboration between RDO and ManageIQ was very rewarding, and helped promote the CloudForms message even more, because people could see it in action, and see how the communities work together for the greater good of humanity. I look forward to expanding this collaboration to all of the projects in the Community Central area by next year. The space for Red Hat Summit was huge, making the crowd seem a lot smaller than it actually was. The opposite was true for OpenStack Summit, where it was always crowded and seemed very busy, even though the crowd was smaller than last year. In three weeks I’ll be heading to the High Performance Computing event in Frankfurt. My mission there is to talk with people that are using CentOS and RDO in HPC, and collect user stories. 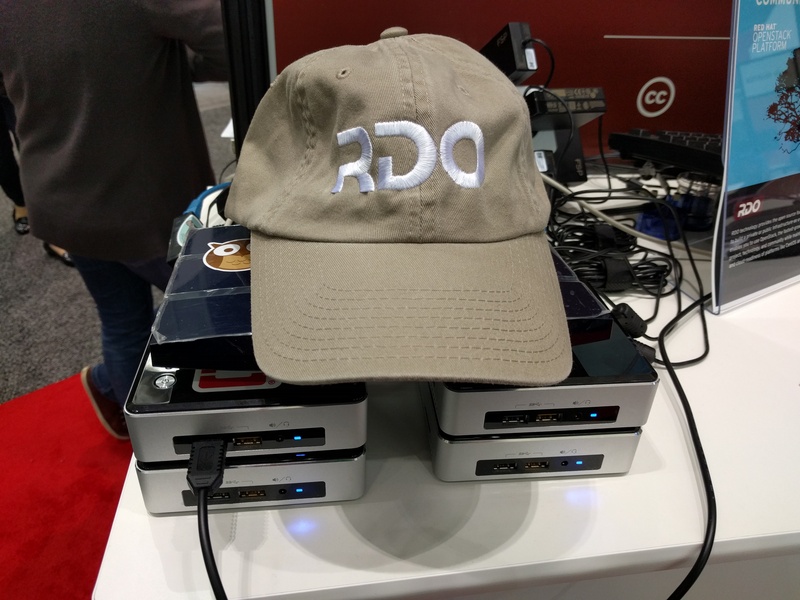 Wednesday was a very long day – about 10 hours working the Red Hat booth, with hundreds and hundreds of people dropping by to chat, get tshirts, ask questions about our various products, and just hang out. While Tuesday was “day two”, Wednesday is the second full day of the expo hall, and so this is the time when you get even less frantic swag-seeking, and more people looking for information. Which is good, because we were starting to run out of the swag. What stood out on Wednesday was the sheer number of people who stopped by just to say how awesome RDO is, and how much they appreciate the work that the RDO community does. Several people also asked how they could get involved in making things happen that are not happening yet. So, this was very encouraging. And Thursday was the final day. We got the expo hall open time wrong, so I was actually there in the booth for 2 hours before it opened. Gah! And then, another really long day of answering questions, and giving away the last of the ducks. The duck tradition that was started in Paris continues, and we plan to have more ducks in Boston. We only had 800 ducks in Barcelona, because I waited kind of late to order, and the vendor was low on inventory. Any suggestions of how the duck should dress for Boston? We closed up just after 4, packed everything up, and I headed to the beach. Unfortunately, right about the time I got there, it started to get overcast and windy, so I only got about a half hour on the beach before I gave up and left, shivering. Oh, well, better than nothing. Thursday night was another dinner-and-fall-in-bed-early evening, as I was completely exhausted. Unfortunately, as usual when I have a flight in the morning, I didn’t get much sleep. I have this bad habit of waking up every few hours to check the clock, even though I have several alarms set. Some day, I hope to get over that. On Friday, I shared a cab to the airport with Jen, and we boarded the flight for JFK. Tuesday, the first day of the main event, was, as always, very busy. I spent most of the day working the Red Hat booth. We started at 10 setting up, and the mob came in around 10:45. Day two of booth duty is always interesting, because it’s after the swag feeding frenzy has died down a bit that you start hearing from the people that actually care about what you’re “selling”. You get the questions. And what’s been fascinating in the 6 summits I’ve attended is that the bar has been raised a LOT on the questions. 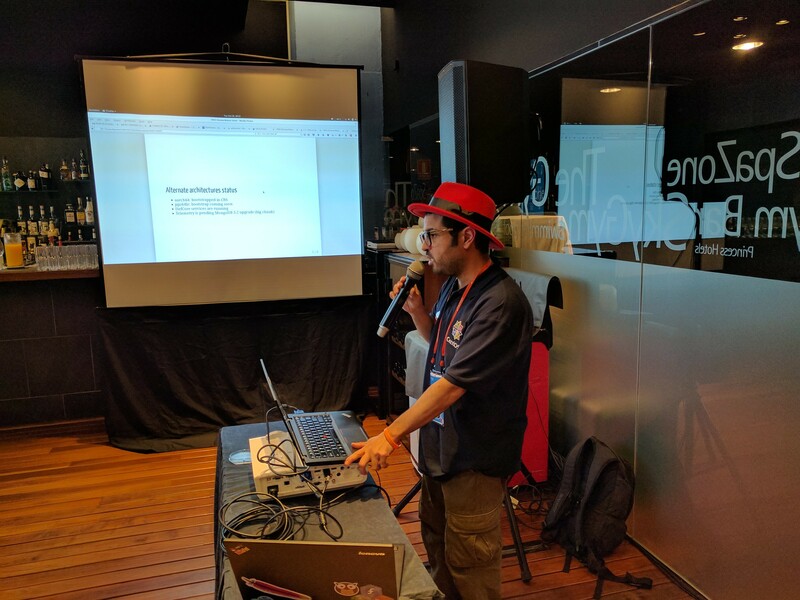 In Hong Kong, my first Summit, there were still a lot of people asking what OpenStack was, and nobody had any idea what RDO was. Now, the questions are about specific deployment scenarios, projects that aren’t yet being packaged, the future of TripleO, and so on, with only a handful of people asking what RDO is. 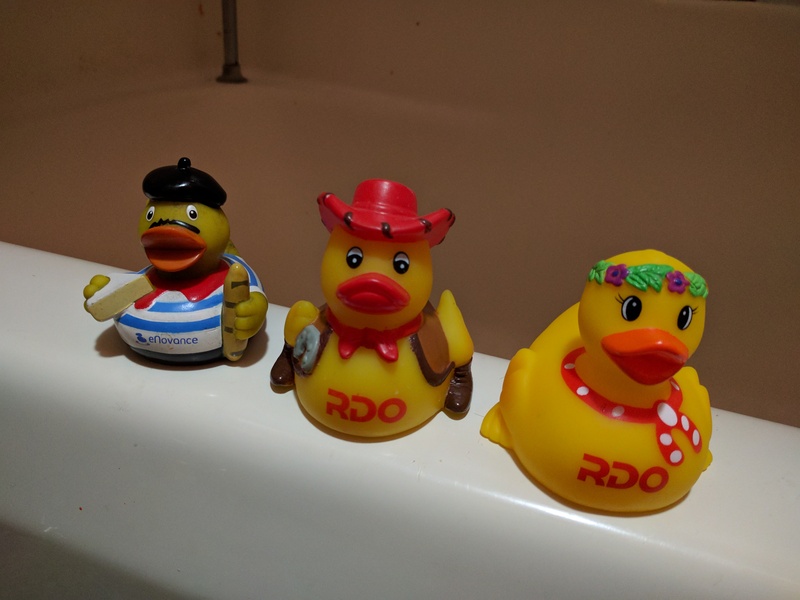 The highlight of the day was the RDO/Ceph community meetup. We had 4 hours at the Gym Bar in the Princess Hotel. Members of the Ceph and RDO community presented, lightning talk style (5 minute presentations) on a variety of topic. Speakers were threatened with being thrown in the pool if they went over 5 minutes, but we managed to restrain ourselves. By the end, we had checked in 215 people overall, and we had 12 speakers. The food was good. The speakers were awesome. The only complaint was that the people not actually listening to the talks would NOT shut up, so it was hard to hear. Eventually, one of the speakers shouted at them to shut up or get out, and most of them moved to the other side of the room. I have a recording of the event, but I don’t expect it’s going to be usable, due to the noise level. I haven’t had a chance to review it yet. Next week, for sure. I also hope to have (some of?) the presentation slides from the various speakers posted somewhere. Watch rdo-list and/or @rdocommunity for details. After the talks were over, we had an hour or so left, and I cowardly skipped out. There comes a time when I have just had too much social interaction, and I need quiet time. So, that was Tuesday. Another success, and another day to be glad that I work with such an awesome community. I have the best intentions of blogging every day of an event. But every day is always so full, from morning until the time I drop into bed exhausted. I used to imagine wandering around the world like Hemingway, seeing exotic places, and writing witty stories about the interesting people I met. I have the great good fortune to have the traveling as part of my job. If only I could find the time for the stories. Anyways … I’m in Barcelona for OpenStack Summit. This is always an impressive, and somewhat overwhelming, event, with 7000+ people attending, dozens of companies presenting their various products, hundreds of technical presentations, and after-hour events every evening. On Sunday, I met up with Jen and various other members of the events team to scope out the venue. We walked over to the Princess Hotel where a number of our meetings and social events are to be held. And we walked down to El Boo, where the employee party was to be held. Both venues were just great. Later in the day I visited Sagrada Familia, a cathedral which has been under construction since 1884, on and off, and isn’t done yet. It was weird and improbable, and fascinating, and beautiful. I think the architect’s driving passion was to be different from anything you’ve ever seen before. I also spent a little time on the lovely beach, Mar Bella, which is right in front of my hotel. On Monday, we had the RDO Infrastructure gathering in one of the rooms at the Princess. we had about 20 people in attendance, and made good progress on a number of issues. The Ocata cycle is going to see more improvements to how RDO works. More details on this meeting coming to the RDO mailing list soon. Although the conference didn’t officially start until Tuesday morning, the “booth crawl” was Monday evening – the odd ritual where swag-hungry attendees rush from booth to booth, grabbing all the free stuff they can carry, and having the occasional conversation with booth staff. Sometimes, the booth crawl can be a depressing experience, with people refusing to make eye contact, and just grabbing the stuff. But this was actually really great, with people excited about RDO, and wanting to learn more about we had to show. Monday night was the Red Hat employee party at El Boo. It’s a boat-shaped restaurant sitting on one of the stone piers along the beach, and we had the whole place to ourselves for the entire night. It was a lot of fun. I stayed until midnight, when several friends toasted my birthday. All together, it was a lovely start to the week. And there’s so much more to come. Last month at the RDO meetup in Vancouver, a number of topics were discussed. Jarda talked about RDO-Manager, the installation and management tool based on TripleO. Here’s just that part of the meeting. If the embedded player below doesn’t work for you, you can listen HERE.